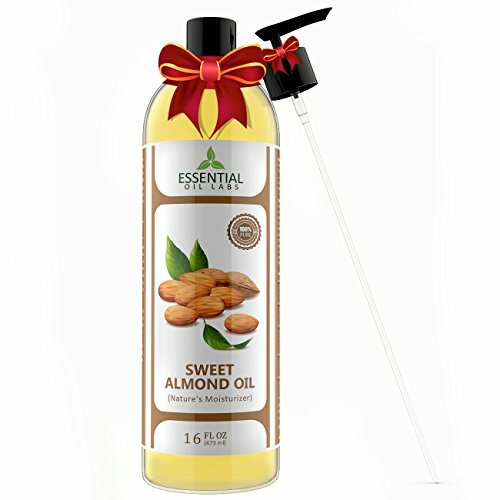 Why use Essential Oil Labs Sweet Almond Oil? Our oil is easily absorbed into the skin. This makes it a beneficial carrier oil for essential oils making it useful for massages and skincare. Sweet almond oil is made up of linoleic acid, glycosides, omega-3 fatty acids, olein and other key nutrients. It has an abundance of vitamins (especially vitamin E) and minerals including zinc, magnesium, copper, phosphorus, and potassium while also being rich in protein which is why it can be found in cosmetics and hair products. Anti-oxidant rich formula keeps skin healthy and youthful. DO YOU HAVE CRACKED OR DRY SKIN? The ULTIMATE SKIN CARE COMPANION. Many Benefits including moisturizing all skin types. Helps treat and reduce itchiness and redness of chronic skin conditions like Eczema and Psoriasis. High anti-oxidant properties helps boost your immune system. Naturally rich in many vitamins and minerals. YOUR HAIR WILL THANK YOU. Protein rich formula will keep your hair silky soft. Helps keep hair and scalp healthy while protecting from sun damage and UV Rays. Natural treatment for dandruff. Promotes hair growth and help to combat Frizz naturally. DO YOU HAVE DARK CIRCLES UNDER YOUR EYES? Works to decrease puffiness and lighten the skin under the eyes. Soothe dry skin, improve your complexion, and evens out skin tone. Helps to treat acne, fade scars, reduce wrinkles and fine lines, and help heal sun damage. Gentle to use for baby and sensitive skin. Makes a wonderful makeup remover. ALL SWEET ALMOND OIL IS NOT EQUAL! We Challenge you to Find a Higher Quality oil. Our Formula is Ethically Sourced in Spain from the highest quality almonds (not bitter) with no Fillers, Chemicals or Pesticides. Only One Ingredient: 100% Pure and Natural Cold Pressed Prunus Dulcis oil. Proudly Bottled and Distributed in the United States in March 2017. Perfect for cooking while helping to promote a healthy weight. Backed by our No Questions Asked Satisfaction Guarantee. Every Household Needs at Least one Bottle of this Versatile carrier and base oil. Our Customers Love to Make their own Body Mist, Shaving Cream, Cuticle Scrub, Hair Growth Serum, Facial Moisturizer, Athlete's Foot and Ringworm Treatment, Pre-sports Rub, Moisturizing Hair Oil, Anti-Aging Facial Cleanser, Baby Lotion, and Homemade Eczema Cream. (All Recipes and Instructions are Included in our Digital Guide). TEA TREE OIL BALM -100% All Natural | Relieves Common Skin Irritations. Great Antifungal Cream for Eczema, Psoriasis, Rashes, Dry Chapped Itchy Skin, Cuticles, Saddle Sores and more! Guaranteed. PRO EMU OIL (4 oz) All Natural Emu Oil - AEA Certified - Made In USA - Best All Natural Oil for Face, Skin, Hair and Nails.